4 More events happening in Asia before the end of the year! Are you going to anyone of them? Last edited by nuaminister on Mon Jan 04, 2016 11:29 pm, edited 2 times in total. Promotions for IPO Manila @ Resorts World Manila is here! No strings attached free hotel or money for registering for the main event through http://www.PokerPP.com . Message me for more details and I can hook you up. 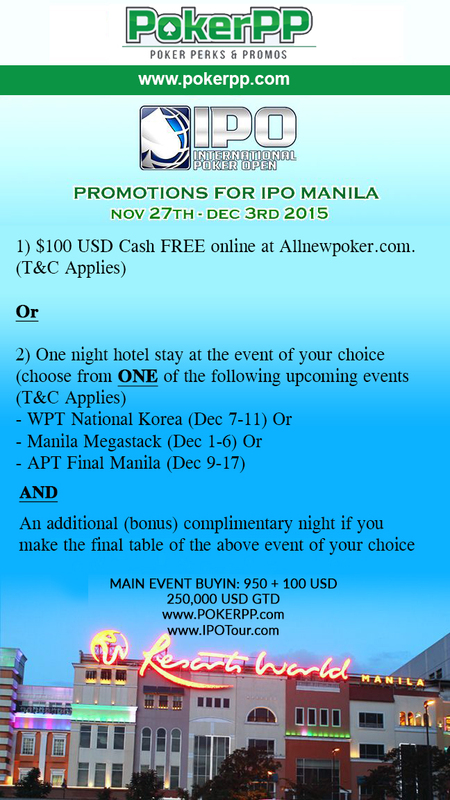 Upcoming promotions for APT Finale Series (Manila) and WPT Korea (Jeju) will be added too. Manila is the capital of Poker in Asia now.